“Werther”is an opera in four acts by Jules Massenet to a French libretto by ÉdouardBlau, Paul Milliet and Georges Hartmann, loosely based on the German epistolarynovel “The Sorrows of Young Werther” by Johann Wolfgang von Goethe which wasbased both on fact and on Goethe's own early life. 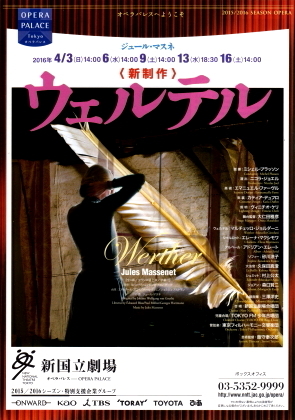 "Werther"is not only a masterpiece of Massenet, is a masterpiece of French opera. Scent of song also fragrant withchanson-style Paris singing Werther! Modern musical style of music is a verystylish, I do not think the music that has been made in more than 100 yearsago. We attracted gradually. Stupid, to pathetic Werther whichwas scattered with the package in bloom with the package.